I develop applications in a LAMP(Linux Apache Mysql and php) environment so i thought it would be interesting to provide a php development environment using a Raspberry Pi as a web server. This instruction sheet will explain how to install lighttpd with php support, to allow the building of web applications by anyone with a Pi. The Debian distribution allows the installation of Apache which is my webserver of choice, however as the Pi has linited memory i thought i would try to set it up with lighttpd which appears to have a smaller memory footprint than Apache. agree y to Do you want to continue [Y/n]?. The above should be shown, if it isnt then please re-run the steps above from 3. 5. If we see that the Raspberry Pi is listening on port 80 then we can test from a browser so open a browser on your PC and goto http://[IP Address] where [IP Address] is the address you you created for your Pi during the setting up remote access process step 1.
and you should see the following displayed in your browser. If you get the above then the lighttpd server has been successfully installed. 6. 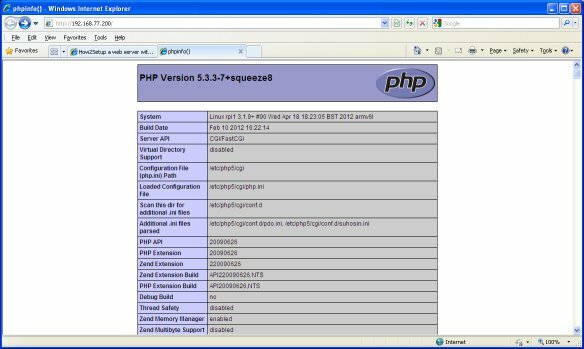 Right the web server is installed so let us now add the php interface to the web server using the php common gateway interface installation(php5-cgi). agree y to any y/n questions. 7. Once php5 has been installed we need to modify the lighttp server config to link php files to the php5-cgi. And you should be able to see the lines you have added. 9. Next we need to restart lighttpd to ensure that the php-cgi module is installed. 10. Lets create a test php file so we can see that the php is installed and working. Lighttpd uses the /var/www folder as its default path so we need to add an index.php file to this folder so lets create a file. In this file we need to insert the following 3 lines for the test. and save the file. This piece of php code will show the configuration of your php installation. 11. Check you wrote the file correctly. 12. Last step - see if all ok. Open a browser on your PC and goto http://[IP Address] where [IP Address] is the address you you created for your Pi during the setting up remote access process step 1.
and you should see a screen as below displayed in your browser - if not check back through the instructions.